Little Peach Lewesia is native to western North America. 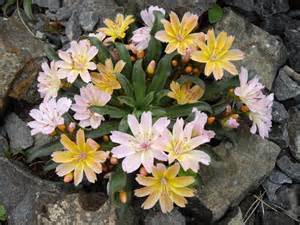 It is one of the prized rock garden plants. It will form low mounding rosettes of evergreen leaves. The blooms are large star-shaped orange to peach with a splash of yellow flowers in late spring and early summer. The blooms will attract butterflies. It will grow from 4" to 6" tall and 6" to 8" wide. Use Little Peach Lewesia in a rock garden, along rock walls, alpine troughs, or containers. It will grow best in full sun to partial shade in well drained soil. Little Peach Lewesia will become drought tolerant once it is established. You can even try this one in a Moon Garden or a Rock Garden.